A good takeaway/dine in. They offer a range of local fish/seafood.......the King George whiting was my choice and it was "a winner" ! Welcoming, friendly, efficient service with a smile. Perhaps a bit expensive overall. Hi. Thanks for the review. This business has been closed for several months. Perhaps you meant to review another Takeaway in Kingscote? We ate here both nights that we were in Kingscote as there did not appear to be much choice available. Out takeaway fish and chips on the first night were so good that we were very happy to return. Thanks Dona. We are happy to hear that you enjoyed our fish and chips so much that you came back for more! We hope you enjoyed your trip to our beautiful Island. We had for dinner burgers and chips. The kids loved it and it were really great burgers. Made to order, not frozen, great taste. Loved it. Definitely recommend.. Thanks for your feedback. We are so glad that you enjoyed your meal and hope to see you again soon! We had a fabulous experience! Our meal was made fresh not frozen. The flavors were outstanding. They were very friendly and helpful. The place was very clean!! I would recommend everyone should drop in and experience a fabulous mail! Just drop in and order a standard to make sure you get it quick. The place is not ready cozy. The limited choices in town make it an option. Thanks for your feedback. 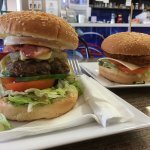 We do provide a traditional Australian Take Away menu and pride ourselves on cooking it fresh and fast. On Saturday nights we usually have a few specials available to expand our menu. We hope to see you again.